For a rural village Wye has an unusually dense and compact built form, but beyond the village the population density of the parish of Wye with Hinxhill is just under one person per hectare. However, the shops and facilities serve about 8,600 people (based on Wye Surgery's list of registered patients) from Wye, and several neighbouring rural parishes. 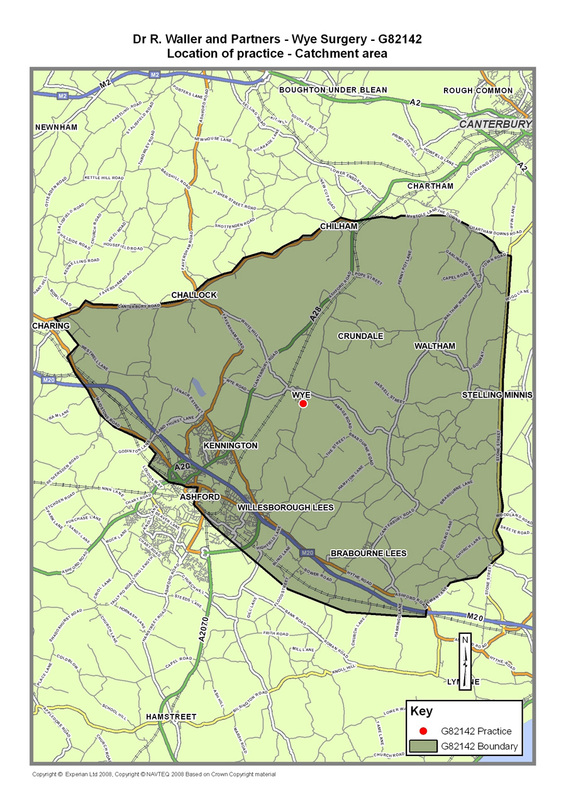 The Wye Surgery practice boundary and patient catchment area covers about 120 square miles, and almost all of its patients live in the Kent Downs Area of Outstanding Natural Beauty (AONB). The Our Place Wye programme area is defined by the Wye Surgery practice boundary. The two Lower Super Output Areas in Wye ward show extremes of both affluent and deprived households; and the two populations are diverging. KCC's Mosaic profile for Wye identifies 14% of the population are in Mosaic Group 'N' (Vintage Value – 'Elderly people reliant on support to meet financial or practical needs'). The comparative figures for Ashford borough are 3.7% and for the whole of Kent 4.3%. A third of the population of Wye is aged over 60. KCC data* for Wye ward (also the parish of Wye with Hinxhill) shows that 800 parishioners are aged over 60, out of a total population of 2,380. Of the 800, 130 are aged over 85, and of this group, 40 are over 90. (*KCC rounds the age groups to the nearest 10). "Population ageing is a key challenge. Changes in life expectancy mean we are all living longer, and as a consequence we need to think about how our life courses are altering and how society needs to adapt. The fact that one in three children born today will live to 100 is definitely a cause for celebration, but we also need to plan ahead to make sure that both today's and tomorrow's older people can live an active healthy life, and that when they need support and care, that support is both available and appropriate." Wye Farmers' Market, The Green: not only a sociable place to shop, but also a chance to go out, meet friends and neighbours, and catch up with the news. In its report published March 2013, 'Improving later life. Understanding the oldest old' the House of Lords Committee on Public Service and Demographic Change warns that both the Government and society are 'woefully underprepared for ageing'. Longer lives can be a great benefit, but there has been a collective failure to address the implications and without urgent action this great boon could turn into 'a series of miserable crises'. To prevent this situation from happening in Wye, the Parish Council initiated the Our Place Wye programme in 2013, and applied to Locality for project development funding.